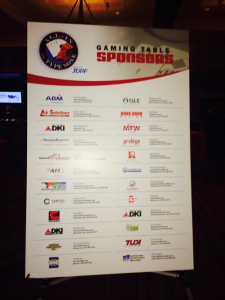 March 2, 2016 –DKI, North America’s largest disaster restoration contracting organization, today announced its involvement with one of DKI Commercial Solutions’ clients, Cushman Wakefield’s, second annual “All-in for Type None” casino night to benefit the Juvenile Diabetes Research Foundation on Saturday, February 27. Type 1 diabetes is a life-threatening autoimmune disease that affects children and adults suddenly, changing their lives forever. Currently, it cannot be prevented or cured. “All-in for Type None” is held annually to raise awareness and money for research. JDRF is the only global organization with a strategic research plan to fight type 1 diabetes. DKI Commercial Solutions, along with several other DKI member companies, including All County DKI, Baxter Restoration, Stress Free DKI and Slays Restoration DKI, as their premier sponsor, helped sponsor the casino night at TPepin’s Hospitality Centre in Tampa, Fla. The evening consisted of Vegas-style casino tables, live music from local bands, No Money Down and Southern Train, food, drinks, dancing, photobooth, live and silent auction, and more! To learn more about type 1 diabetes and how you can help raise money for JDRF, visit www.jdrf.org. Slay’s Restoration has been in the business since 1994, providing disaster clean-up for two generations. The family owned and operated company is a highly technologically diverse firm that can handle large and small losses locally and nationwide. Blending old- fashioned hard work and modern equipment, they offer you the largest capacity and most effective disaster service results possible. For more information, visit www.slaysrestoration.dkiservices.com.